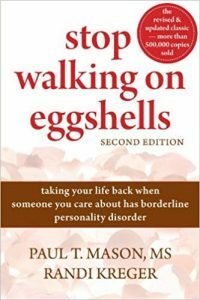 Stop Walking on Eggshells is an in-depth book on borderline disorder personality (BP). It’s especially direct at people in some sort of relationship with a BP, and I found it very good. The authors say that BPD is one of the most misunderstood psychiatric diagnosis. The good news is that it’s possible to improve. People with BPD feel and do the same as any other people do. They just feel more intensively and act with more extremely. And they have bigger difficulties in regulating their behavior. They look for a nurturing caregiver with never-ending love and compassion to fill their void. BPs are always terrified of losing a relationship (extreme anxious attachment) while at the same time they have such low self esteem that they don’t understand how anyone could be with them. BPs have trouble differentiating between physical absence and abandonment and they can continually call their partners to reassure themselves they’re not alone. They seek and long intimacy but their behavior only makes intimacy more unlikely. The best predictor for a BP to keep a relationship is to get into therapy and taking steps to cure themselves. BPs often misread messages in the most negative way possible. For example if you cancel a date because you had to work longer, they might jump to the conclusion that you don’t want to see them ever again because you don’t love them anymore. If you say you are so proud of your daughter, your BP wife might hear that you love your daughter more than her. For BPs it’s hard to understand that you might need to cancel and still wanted to see them. Or even deeper, that you can might be angry with them right now, but still overall love them. If the self-mutilating behavior is taking too big of a toll on you, step back. The best way to support someone, in the long run, is taking care of yourself in the short run. Between 8% to 10% of people with BDP commit suicide. Many BPs also make suicide threats without actually every attempting suicide. One BP recommends not to tell BP to calm down because they are not in control of their emotions and it only makes them feel worse. It’s important that you enforce your boundaries and assert your limits for proper communication and behavior. Don’t say that you want it like that because it’s “normal” or “expected”. Just state it as the way you want it. For example you can say that when things get too intense and the BP starts screaming, you will stop the conversation and return to it later when you’re both calmer. Stay away from arguments on whether your arguments are right or wrong. Whatever limits you decide to set, it’s important you don’t accept abuse and rage. It’s bad for your relationship, for your self esteem and for possible children. If you don’t have children yet, the authors recommend you postpone children until the BP has taken steps forward in therapy. Some of the stories in Stop Walking on Eggshells really make you understand how difficult it can be to raise children with DBP. Children might plot against their parents or lie to cause troubles to their parents. You must also be vigilant that they don’t cause harm to other siblings. BPs don’t know boundaries, and in the extreme that might mean abusing siblings. But whatever happens, they say, remember that it’s the disorder that is causing the problem and that BP children need love as much as other children (and maybe more). Distortion campaigns are web of lies, false accusations and other harmful behavior the BP engages in to damage you. It can also come from former friends. The problems with BPs is that when you end a friendship or relationship they don’t remember the good of the relationship. Or they fail to see you as a whole person with both good and bad. You can easily become the embodiment of everything that is bad and evil for them. To guard against possible BP revenges, think in advance. What can they do to harm you and what can you do to defend? With prevention don’t forget though that you might want to avoid stoking their fire with too an aggressive defensive plan. There are several biological and environmental risk factors that combine to increase the likelihood of BPD. Stop Walking on Eggshells then goes into current medications and treatment. It says that mindfulness as part of Dialectical Behavior Therapy is very promising. I won’t get into the medications here as new drugs and researches come out every year and a few Google searches can provide more updated information. If you are a BP there are good news: people do get better. Be willing to stare at the reality of things and work on yourself do grow your emotional intelligence (check Goleman, Tradberry). BPs who yell at you, abuse you and do public scenes while at the same time refusing any cure are low quality people. Having had an experience like that, I would advise you don’t date them unless they are willing to take part of the blame and work on themselves. Quite frankly, I’m not sure this is a con. I highly appreciated the author’s heavy immersion into discussion boards to get real life stories. This is not a medical text, but it’s “medical enough”. Why did I even put it as a con then? Well, you know me… I like the resources and the data too. BPDs Overlapping With Other Psychiatric Disorders? The authors make some examples that seemed more on the sociopath / psychopath end of the spectrum. Like the girl at 14 who tried to hire gang members to kill their parents. Very good overview of the borderline personality disorder which gives both the medical information and the practical, “day-to-day” translation of what it means. The recommendations are very, very good. Including the communication tips, they are of very high quality. I very much enjoyed Stop Walking on Eggshells. Without getting too technical and clinical, it gives a very good overview of the borderline personality disorder. And it gives great suggestions and recommendations and how to handle BPs. I had a girlfriend with BPD, and reading this book was a bit like a jump in the past. For a guy who had never experienced anything similar it was shocking to see her starting to get drunk as quickly as possible to numb the pain and get my attention. And of course, when she started scratching her hand more and more furiously till it started (lightly) bleeding. If you are dealing with a BP, definitely get Stop Walking on Eggshells.